Does or will Audi support Apple Car Play? 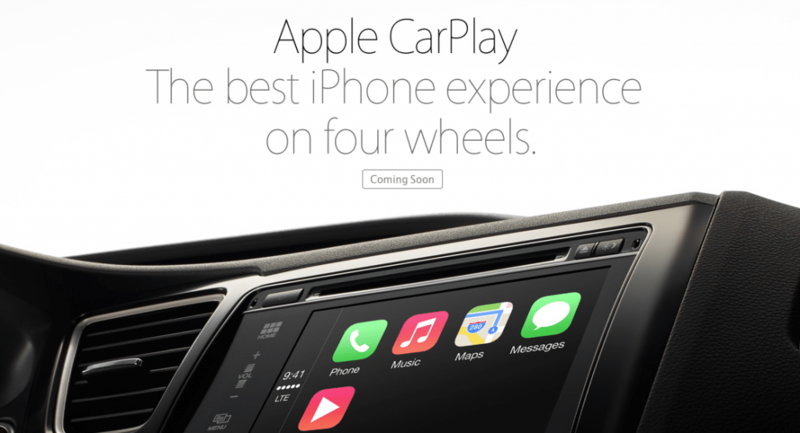 Home » Does Audi support Apple CarPlay? Does Audi support Apple CarPlay? Apple CarPlay allows you to connect your iPhone 5+ via the lightning connector and have selected apps displayed in a simplified form on the dashboard. The simplified form means that the driver isn’t distracted by all the usual fun and features of a their iPhone. I’m desperate for this functionality in my Audi. I drive a high end model that’s only a year old but the Audi MMI system is like something from days of MS/DOS and painfully slow and clunky. Even the MMI integration with the iPhone that it supports doesn’t work that well. I’ve now given up with it and put a cheap air vent iPhone holder next to the steering wheel and use the TomTom App for navigation which is infinitely superior to the Audi built in satnav. I’ve got an iPod touch in the glove compartment connected to the MMI interface for music and podcasts. When I heard about the Apple CarPlay system I got excited. Some car manufactures are planning to offer upgrades to existing customers so that their cars can support CarPlay. Anyway I tend to replace my car every 2 or 3 years so I thought no doubt my next Audi would support CarPlay. Sadly it doesn’t look like Audi are planning to support CarPlay. Their name is missing from the list of manufactures on the Apple website. Further Audi is currently backing Google and an initiative called the Open Automotive Alliance launched in January 2014 at the CES trade show in Las Vegas. So at the time of writing (March 8th 2014) there is no public sign that I’ve been able to find that Audi have any plans at all to support Apple CarPlay. I can’t honestly believe that they won’t ultimately have to back both standards or risk losing serious market share. You see the thing is these days all new cars are actually really good so the purchasing decision is heavily influenced by little things like dashboard features. Ask any car sales man these and they’ll tell you that one of the most frequently asked questions they get is ‘will it work with my iPhone’. I hope Audi do get tho sorted out in the next 12 months before I look to change my car or I’ll certainly very seriously consider another car brand. As and when I receive any more information on Audi’s plans for Apple CarPlay I’ll post an update. Update June 26th 2014: At its Google I/O developer’s conference in San Francisco, this week they announced Android Auto, their answer to Apple’s CarPlay. Much like CarPlay, Android Auto is designed to bring the Android experience to a car’s in-dash infotainment system. Google said that Android Auto is contextually aware and puts the apps that users need front and centre on the car’s dashboard. Google stressed that Android Auto is “completely voice enabled,” relying on Google Now much the way CarPlay relies on Siri for voice commands. In my simple view having two such similar systems in the marketplace is yet more reason that firms like Audi need to provide a choice between Apple CarPlay and Android Auto, preferably as an automatic configuration based on whatever handset you plug into your dashboard. Update June 27th 2014: Today Audi formally announced that they would be supporting Apple CarPlay in a press release they say, Our customers want to be ‘always on’ and use the services they know from their smartphones in cars as well,” says Prof. Dr. Ulrich Hackenberg, Board Member for Technical Development at AUDI AG. “In this regard, we are working closely with leading companies like Google and Apple. In the future, customers will be able to use the functions available to them on their smartphones via the operating systems in their cars as well. This is really good news for everyone. What we need to know now is when and if Audi issue an update to their MMI so that CarPLay can work with any existing models. Update January 12th 2015: Apple have now launched a page with the official list of makes and models that support Carplay. As of today the list of Audi models supporting Carplay is still shamefully small with just the A4 and Q7 being listed. It’s interesting that their parent company VW are showing that they support CarPlay on almost every model. I agree. May finally be time to switch car brands. Sorely disappointed. I totally agree. i do not understand how a giant car constructor as Audi could miss Apple iOS integration in their new cars. Very dissapointed. It’s astonishing that a premium mark like Audi would sign on exclusively with an Android in-car OS. It may be, as has been noted in a recent CNET article (http://www.cnet.com/news/audi-in-discussion-with-apple-to-bring-ios-to-its-motors/), that Audi will “not leave Apple devices out” but this does not necessarily mean they will adopt Apple’s CarPlay. They may just do a botched integration of Apple devices and call it done. Let’s hope they go a little further than that. Surely in this day and age car manufactures could adopt any system? After all it’s only software as the portable device is doing all the processing! Brian, I completely agree and some car manufactures are doing this or at least talking about it. Technical Apple Car play is a module that runs on the cars QNX based dashboard to harness the processing power and apps on the iPhone. I believe this is the same approach being taken by Android Auto. It should therefore be an easy to have both modules installed and toggle back and forth on the infotainment system. It should also be possible to implement an automatic switch on QNX that detects the type of phone that has been attached and which then boots up the correct module (Apple Car Play or Android Auto). It’s fascinating to track how this develops. I’d like to think they would provide an upgrade to models from the last couple of years. In the past Audi have made available upgrade modules for iPhone/iPod for previous year models. I looked at adding their iPhone module to my old A3 and they quoted about £100 in the UK to supply the module and install it which seemed reasonable. Audi really need to provide these low cost upgrades or it starts to affect the second hand value of their cars and their reputation for durability and serviceability of their cars.